We first got involved with Live Ferments with a fermented tea called Kombucha, and we were hooked from the beginning. The transformational process of fermentation was fascinating and inspired us to explore other ferments, such as pickled veggies, kefir, pro-biotic sodas and more. Driven by the belief in the importance of eating food that is alive, we began to create crackers and other raw food desserts made from live nuts, seeds, fruits and veggies. We make an effort to use ingredients that are as local, fresh, and organic as possible. We feel proud to offer quality, healing, live foods. We can heal ourselves by the food we eat. Enjoy! After much trial, error and learning, Eliezer now focuses on a wide range of products which he has been developing over time. However, he is always checking out new products, and varies the tastes with the seasons. You may add Shorshei Tzion products to your weekly boxes via our order system. The watermelon requires much heat, a throwback to its origins in South Africa and the Kalahari Desert. In the desert, the watermelon, which contains over 90% water, was an important and vital source of liquid to man and wild animals. The difficulty of choosing a good watermelon is an old story. In its wild form, the sweet watermelon is identical on the outside to a bitter watermelon, which is why the thirsty passerby would punch a hole in the watermelon rind to check its taste. From North Africa, the watermelon hit the Middle East where it grew well and was even mentioned in the Mishna. It arrived in China in the 10th century, and today China is the champion watermelon grower, followed closely by Turkey and Iran. In the 13th century, the Moors brought it with them to Europe, along with other plants they met in Africa and Asia. The watermelon arrived in America with the black slaves, as well as the settlers arriving from Europe. Chubeza’s love affair with watermelons started with naiveté, pretentiousness, and… failure. During my last year in California, just before I established Chubeza, I raised red, orange and yellow watermelons (the inside colors) in the farm of Joe Perry, my mentor. We had nice success with the yields, and I was under the impression that growing watermelon would be simple, so I added watermelon to our crop list. The first year, the watermelons simply did not grow, and we only picked a few dozen from our fancy beds. Fortunately, back in 2004, our entire clientele also numbered a few dozen, so they received the watermelons as planned (which, admittedly, weren’t too sweet). One of the main reasons for this failure was the timing. I seeded watermelons like in California, at the end of spring. Yet springtime in Israel is fraught with viruses and disease, particularly among the cucurbit family to which our watermelon friend belongs. After taking a hiatus of several years, gaining experience with cucurbits and their viruses, we made a second watermelon attempt four years ago. This time we seeded earlier and harvested a larger yield. A year later we did even better, and two years ago we dared to plant seedless watermelon plants. 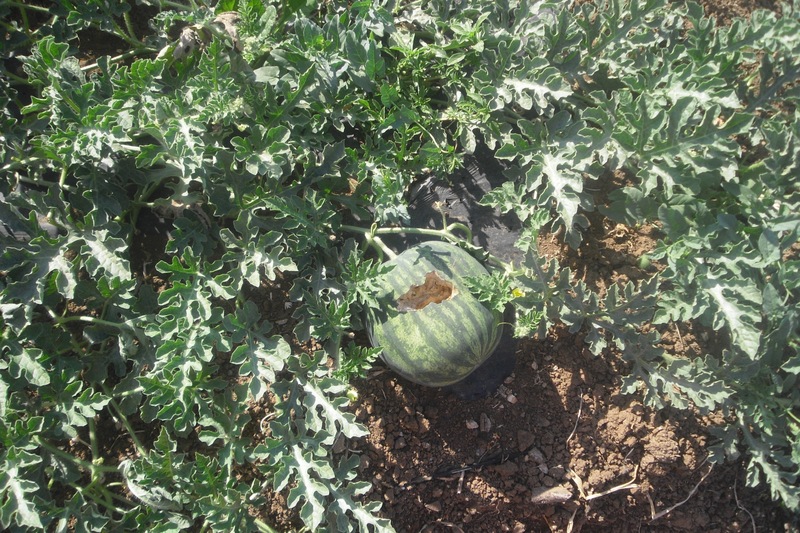 This sort of watermelon-growing is more complex than raising a standard seed-filled watermelon, for we are essentially trying to fight nature. The mission of every fruit and vegetable is to reproduce and generate offspring (seeds). Man, meanwhile, is bent on getting rid of the seeds, and not by spitting them out: human beings had grown weary of seeded fruits and set out to develop seedless varieties. Actually, a seedless watermelon does contain some tiny seeds, however most are transparent as well as infertile. You must admit this is strange, to try to develop a fruit which cannot produce seeds, offspring: on one hand, a vast scientific effort is being placed into refining and improving human fertilization via IVF, freezing embryos and sperm, surrogates, etc, and simultaneously, we are encouraging sterility for the fruits. So how do these “seedless” watermelons work? Regular watermelon seeds are diploid seeds, i.e., containing two sets of X chromosomes. Those used in order to produce seedless watermelons are tetraploid, possessing four sets of X chromosomes. Seedless watermelon seeds have a harder than average shell, which is why it is more difficult to grow the melons from seeds. In most cases, they are planted as transplants that were started in the nursery under controlled conditions. The tetraploid seeds sprout and become plants that will generate leaves and flowers, but no fruit unless they’re fertilized from flowers of a regular seeded watermelon. Therefore, you must plant one plant of regular watermelons for every three-four plants of seedless ones. During pollination, each seed contributes half of its chromosomes: 1+2, resulting in a fruit whose seeds are tetraploid- possessing three sets of chromosomes. This number disrupts the seed’s ability to reproduce, and ultimately sterilizes it. Thus we receive a fruit which is juicy and sturdier than its seeded friends, but it evolved from the “virgin propagation” of an unfertilized cell. It’s called “a Parthenocarpic fruit,” in essence, the mule of the botanical world. Which is when we cover the bed with a bird net to allow us to enjoy the wonderful treat of this sweet, red, juicy delight. Watermelon is a healing fruit. Its large water content cleanses the body, making watermelon juice highly recommended for those suffering from bladder and liver deficiencies. It is also beneficial for cleansing the kidneys. Watermelon even helps to clean the body of cigarette smoke- -highly recommended for active and passive smokers. Traditional Yemenite folk cures use watermelon seeds to rid bad breath and stains from the teeth and mouth. Crush the seeds well, immerse them in water, and then strain for a super mouthwash. In Iraq, the watermelon rind is used to treat fungal infections. Lybian Jews are known to rub their skin with watermelon rind to lighten age spots. Watermelon contains vitamin A in the form of Carotenoid, vitamin C, and vitamins from the B group as well (B1 and B2). It is low in nitrogen and high in potassium. Further information about the nutritional and therapeutic virtues of our round, red, delicious friend can be found here (Hebrew). 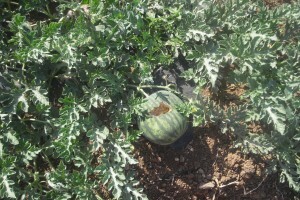 – We pick the watermelon at its ripest, when the tendril near the stem dries up. But when choosing a watermelon at the stand, see if you can determine whether the stem is a little dry, indicating that the watermelon wasn’t picked while green. – The part that comes in contact with the ground changes its color to yellow, so you should look for a yellow spot on one of the watermelon sides. – And the most mysterious signal of all: if you tap on the fruit, you will hear a dim sound reverberating back to you. The best temperature to store a watermelon is 12° C, but at room temperature (23°) the watermelon can be kept for a week to 10 days. A watermelon left out at room temperature for too long will lose its taste and change its texture. It is not recommended to freeze a watermelon or store it in the cooler compartments of your fridge. Overexposure to cold can cause frostbite, taking a toll on the watermelon’s taste and making the inside soft and powdery. To store it after opening, wrap in plastic wrap and store at a temperature of 3-4°.